If you follow me on Instagram, you know that last week, I found the sweetest baby kitty roaming around my veggie garden. Unable to take her in, I brought her to Vicki, a volunteer with Feline Rescue, a St. Paul-based no-kill organization, devoted to helping stray, abandoned and abused kitties. In just a week’s time, Vicki’s had our little four-month-old girl spiffed up at the vet and spayed, making her ready for adoption! If you are interested in meeting this affectionate little baby, she’s available for meet ‘n’ greets at the Southside Farm Store, with an adoption fee of $125 (all proceeds go to Feline Rescue). I’d keep her in a heartbeat if I could, but I’m sure she’ll find a good home in no time…maybe even with one of you? 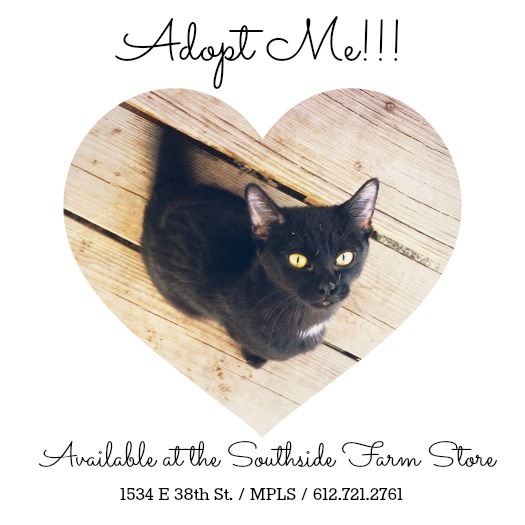 This entry was posted in Uncategorized and tagged cats, feline rescue, kitten, kitty cats, rescue, south minneapolis, southside farm store, stray by highplainsthrifter. Bookmark the permalink. AW she is ADORABLE!!!! I would love to take her in but I have 2 cats and live far away. And the older cat is somewhat special needs as he is always sick. I really hope she finds her forever home soon. <3<3 thank you for not taking her to a kill shelter. So many animals don't ever leave those.